The word “scale” plays a big part in the ongoing speculation about 3D printing, but it tends to apply to matters of production and enormity. One team of German researchers is casting light on a new aspect of the form, one not visible to the naked eye. 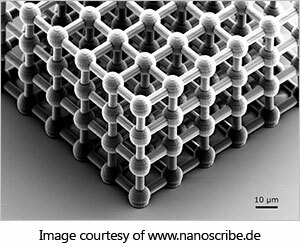 The Karlsruher Institut für Technologie (KIT), in partnership with the Nanoscribe Gesellschaft mit beschränkter Haftung (GmbH), is developing structures built around nano-scale, honeycomb-like layers. The theory is that the strategic layout of these structures will produce more strength with less material, thereby increasing efficiency. Engineers use photoresist, a material used in computers and engraving, as the primary material for the structures; they then coat the structure in alumina, a synthetic aluminum-based compound. Simply put: The photoresist is the frame and the alumina the armor. The combination makes for an overall product of “optimal” strength. That, however, is only part of the picture. KIT and Nanoscale have placed just as much emphasis on the lightness of the process and materials as they have of strength. This is overall in step with the direction of engineering in general, as seen in the latest generations of buildings, aircraft, and automobiles. Take a second to think about it—lighter, less consumptive structures would place less stress on the space they inhabit; likewise, lighter objects permit greater portability. Like the components that make up the process, this nano-sized form of 3D printing can offer breakthroughs on scales big and small. So, you might be thinking, how does this apply to me as a consumer? 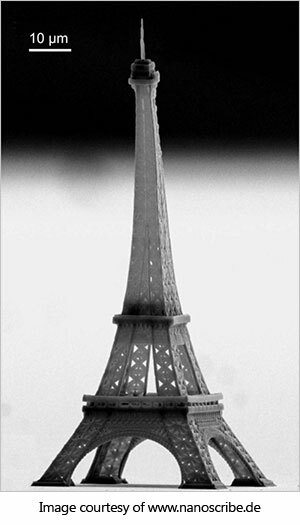 Nano-scale printing is a process on the horizon, and one that uses less material to create stronger objects. Use less, save more. Even better: You’re using less and saving more while creating a stronger object intended to last longer.